In a letter to affiliated student unions in November 2018, NUS President Shakira Martin and acting CEO Peter Robertson announced that “radical reforms to democratic and corporate structures” must be made to plug a projected £3million deficit. Previous years’ accounts suggest the money problems may have come from the NUS Extra discount card scheme, now TOTUM. We don’t know yet exactly what the reforms will be, but rumours and euphemistic talk of “a streamlined, simplified organisation” suggest drastic cuts to the organisation’s democracy and campaigning arm, leaving it as little more than a think tank and service provider. Scrapping the elected NEC (National Executive Council, which meets regularly to hold the leadership to account and make political decisions between conferences.) Previous democracy reviews have already removed the NEC members’ stipends, which allowed them to travel to campuses to help students and SUs implement NUS policy. This will mean an NUS with even less student control. Fewer campuses will be represented, FE representation will be vastly reduced, more day to day decisions will be made by unelected and unaccountable managers. Slashing campaign budgets. Liberation campaign budgets have already been cut by 40%. NUS is nothing if it can’t run outward facing campaigns. At a time when the far right is growing, hate crimes on campus are on the rise and marketisation is sweeping through the education sector, a campaigning NUS that can fight for students is more crucial than ever. Cut backs must be made first to senior management’s excessive salaries and the commercial services arm of NUS. Our union’s ability to fight for us must not be dependent on how well its discount card fares in the market. Particularly when NUSSL (the commercial purchasing arm) isn’t even accountable to NUS members! Cutting the number of full time officers, including 2 out of 3 officers for NUSScotland and NUS Wales, plus Liberation Officers which represent students from marginalised groups. Binned positions could include the Trans Officer (won in 2016 after years of campaigning), International Officer, LGBT (Women’s Place) and the Women’s Officers for NUS Wales and NUS Scotland. We have no guarantees that NUS Scotland and NUS Wales won’t disappear completely (NUS-USI is a separate entity). STUDENTS AREN’T IN CONTROL – SO WHO’S MAKING THESE DECISIONS?? A turnaround board has been appointed to draw up proposals. This board has no elected members, and is made up of unelected staff and a minority of ‘selected’ NUS officers. SU Presidents and CEOs got together with NUS managers at NUS Strategic Conversation 27-28 November to discuss them. You can see why we’re calling this an anti-democratic coup. Students have no opportunity to feed into the decision making, while unelected, unaccountable senior leadership debate scrapping the democracy of an organisation they are not a part of, or a liberation campaign they are not represented by. CEOs on six figure salaries have nothing in common with students. NUS have said that students will have the chance to feed in through their Students Unions. But there is no requirement on Presidents to hold All Members or Student Council meetings to discuss proposals. Where they do occur, there is no guarantee that students at these meetings will hear the whole story or a full range of views, or even that anything anyone says will be allowed to change the process. SO HOW ARE WE GOING TO FIGHT THE CUTS AND TRANSFORM NUS? 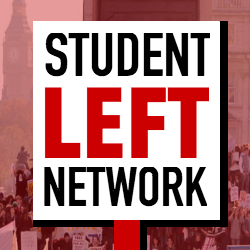 The Student Left Network is a newly formed broad coalition of student activists involved in campaigns to transform our universities, education and society. Go to studentleftnetwork.com/unitetheleft to see what we’re fighting for. If you agree, join us! We are campaigning for a vote of no confidence in NUS President Shakira Martin because she has shown that she is the wrong person to run the union at this time. As President, not only has she allowed the situation to reach such a crisis point that urgent action must be taken, but her response to the financial problems has been deeply undemocratic, and takes the union further away from being a campaigning, militant voice for students. We have an alternative. Students have a chance to take control of NUS and vote for a real alternative. If the no confidence motion passes in 25 affiliated student unions, an extraordinary conference will be called. This conference may be an extra day added to National Conference, or it may be before. It will give the student left a chance to discuss the future of NUS on our own terms and ensure we have adequate time to debate the cuts and present our own alternative. NUS OPEN THE BOOKS – NO DECISIONS MADE WITHOUT STUDENTS! There must be a democratic, transparent and accountable student-led investigation. The only body that must take decisions is National Conference or a properly constituted extraordinary conference with elected delegates. Delegates must have the final say, not a semi-elected trustee board. We have a very different vision. We want a radical, campaigning NUS that is much more democratic and representative, with real control in the hands of its elected representatives and student members, not unelected and highly-paid senior management. NUS should link up student activism on rent, precarious work, mental health services, migrants’ rights and climate change and spread these struggles across the country. A drive to set up active student unions in every FE college and school, run by students not management, would both provide NUS with more money from affiliation fees and give students the chance to lead campaigns. NUS needs to get back to basics. It must ditch the expensive but ineffective think-tank stylings and move to grassroots student campaigning. Grassroots campaigns from Rent Strike to the National Campaign Against Fees and Cuts demonstrations show you can pull off much more effective campaigns with a fraction of the budget. Our strength doesn’t show in laminated folders or costly gimmicks but in students on the street and with staff on the picket lines. We need a President who will help build a union whose strength and leadership lies with students and through which we can defend our rights and fight to transform society. NUS can be so much more than a bureaucratic, top-down think-tank. WHAT CAN I DO ON MY CAMPUS? Share this guide so students on your campus know what’s going on and how they can fight back. Talk to your Sabbs, liberation officers, activist groups and liberation groups. Demand your SU President holds an all members meeting to discuss the situation. Invite us to put across our view or even host a debate!